There are few campuses that have as many houses surrounding them as the University of Oregon does. Eugene houses for rent are literally everywhere around the campus. Literally. We're not talking figuratively, people! With so many options, it's crucial to have an easy way to compare houses for rent in Eugene and that's where Rent College Pads comes in. In the instance that you're looking for University of Oregon off-campus housing, Rent College Pads is your number one resource for comparing tons of landlords around the University area. Whether you're searching for a duplex, house or another rental near the University of Oregon campus, it's always been a chore. Walking up and down 13th, 14th or 15th ave west of campus writing down phone numbers off of for rent signs is no way to spend the best years of your life. All of our off-campus housing options have been verified and approved by our diligent team. We'll even follow up with you and the landlord to make sure you have found your perfect house in Eugene. Because there are so many options to consider before making a responsible renting decision, learn more about the rental cycle and how quick you need to find your next place in our University of Oregon guide in the tab above! 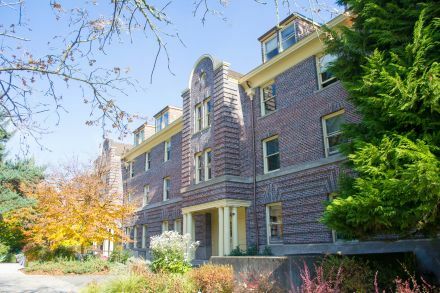 For University of Oregon students hoping to live off-campus during the fall semester, the best time to sign a lease is during the spring semester. Studios and one-bedroom options won’t fill up as fast, but if you’re looking for options with two or more bedrooms, particularly duplexes or houses, you’re going to want to start your search before spring break. The early bird gets the worm! Rent nearest to campus can be a little pricey if you choose to live in a studio or a one-bedroom apartment, but the good news, if you’re hoping to lease a smaller place, is that rent at many of these apartments includes utilities, as well as amenities like parking or a flexible pet policy. For students looking to spend a little less every month on their housing, splitting rent on a multi-bedroom place lowers the cost pretty significantly. Below is a price breakdown per bedroom. University of Oregon students are lucky to have a wide array of dining and bar options very near to campus. The blocks around campus offer plenty of options that show off the vibrant, urban vibe of this small metropolis, and many of the bars double as live-music venues. Check out some top rated eateries and bars below! As previously mentioned, outdoor activities are a huge part of life for University of Oregon students. On nice days, students can walk, bike, or run the Willamette River Bike Trail, check out the flora and fauna of Hendricks Park, or hike Mount Pisgah. McKenzie River National Recreation Trail offers breathtaking views of waterfalls, and Skinner Butte Park is a great place to go for a quiet, easy hike. Just south of the Jefferson Westside is the Friendly neighborhood. Originally, the name came from an old 19th-century mayor, but many years later, the neighborhood has been getting a reputation for being, well, friendly. Caring for your neighbor and community is important to residents of Friendly. Walking down the streets you’ll come across small, locally owned businesses like cozy cafes and corner shops where the owner knows you by name. The Friendly Street Market has grown to be a go-to spot for residents where you can shop for fresh organic produce, wine from local vineyards, and natural healing remedies. Current residents fully support the use of the LTD bus system for carbon footprint reduction and have also started a community garden. With an emphasis on a simple, carefree lifestyle, residents can also enjoy one of the several area parks like Madison Meadow, Washington, or Friendly Park. Just south of Downtown is the Jefferson Westside neighborhood. Jefferson Westside is known for being a hopping point from West Eugene to the Friendly area while also being close to Whiteaker. In other words, wherever you want to go in Eugene, you can easily get there from Jefferson Westside! 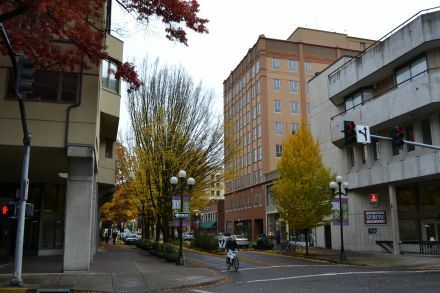 This downtown neighborhood is rated as one of Eugene’s highest populated area and is the city's third most “walkable” district. Said to be a “biker’s paradise” streets are lined with riders and there is a bike path that runs east/west through town. Jefferson Westside is also home to the fairgrounds, Lane Events Center, where you can attend several events year round. One of the bigger parks in this area is Monroe Park, here there are playgrounds, basketball courts, and an outdoor performance stage you can catch concerts at. Just east of Friendly and bordering South University is the Amazon neighborhood of Eugene. Amazon may have a higher population of families, but it’s great for outdoorsy individuals and isn’t a far commute to campus. If you’re wanting to be close to forests, nature, and trails, Amazon is the place for you! This neighborhood is surrounded by the Amazon headwaters that pour from the southern hills before going into the Willamette River. 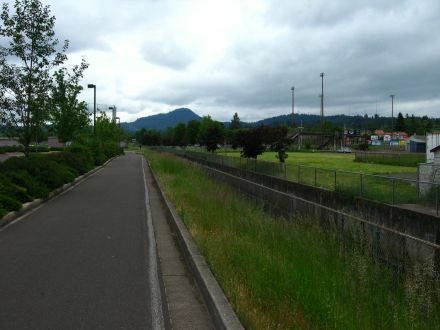 Eugene has a series of large, semi-connected parklands that group together by nature trails called the Ridgeline. In Amazon, the Ridgeline trails bring hikers and bikers down winding trails where some lead to the Amazon Creek. Living in Amazon, you’ll have quick access to the highway, the Amazon community center, Amazon pool to cool off, dog park, and several restaurants. Somethings that residents have said they like about the area is the “walkability” and “community” feel you get. The area that surrounds the University of Oregon campus is appropriately named, University. Split into two major sections, called West University and South University, this area is where the majority of all students live off-campus in Eugene. Within this district, you’ll find most of the businesses are directed towards college student offering cheap restaurants, coffee shops, bars, and bookstores. As the name suggests, West University is west of the University of Oregon campus towards the center of the city. This artsy area has a huge student-dominated population that has tons of bars, venues, and music/specialty shops. Just south of the University of Oregon campus is South University. 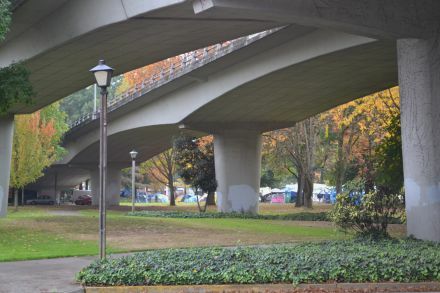 Residents of South University are more of the outdoorsy side and is neighborhood is home to 80-acre Hendricks Park (also spans over Fairmount) and Rhododendron Garden. Commuting to class is easy and downtown is just two miles away, just a quick bus ride and you’re there in no time! Bordering the West University neighborhood is Eugene’s Downtown area. Said to be Eugene’s trendiest area, Downtown has a great contrast of urban meets rural. The area is very walkable and strolling around you’ll come across both new and old restaurants, boutique shops, grocery stores, and a whole lot more, all within a mile radius. The Whiteaker District (around 4th and Blair) is known for accommodating a more “hippy” lifestyle. Where there is more bicycle traffic versus cars, tree-lined streets, live music, funky shops, and popular Ninkasi Brewery. 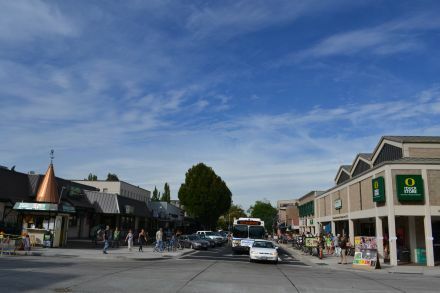 One of Eugene’s popular commercial areas is The 5th Street Market where you’ll also find several shops and eateries. The Corner of Broadway and Olive street is commonly known as the “Barmuda Triangle.” This section of downtown has eight bars all in a row to check out on a Friday night! East of University and Amazon, you’ll find the Fairmount neighborhood. Fairmount residents are very diverse in age but being a close distance to the U of O campus, there is still a good of an amount of students population, as well as families. Residents can easily walk to the area restaurants, grocery stores, pharmacies, etc. A lot of the housing in this area is made up of older homes with sidewalk paved streets where you can catch joggers, dog-walkers, and families out for a walk any time of the day. Fairmount has four city parks: Hendricks, Mission, Fairmount, and Washburne, that residents can leisurely enjoy or utilize for recreation. Eugene is often referred to as “Track Town” and since Fairmount is near the University of Oregon residents will catch the track team running around for practice. Each year, Eugene’s marathon is held in Fairmount as the runners cross through the parks and Willamette River.